The Inter-Mountain photos by Amanda Hayes Queen-elect Cassidy Myers has her sash pinned on by 2018 Queen Charlotte Bellotte. 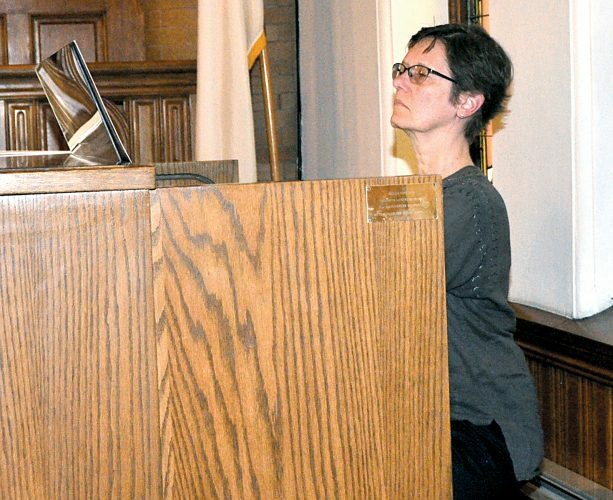 Myers will receive her crown at the May 15 coronation. BUCKHANNON — John Denver’s “Country Roads Take Me Home” is often played at West Virginia University sporting events and at celebrations across the Mountain State. But in Buckhannon Sunday, 18-year-old Gauley resident Cassidy Myers, a freshman at WVU, found that “Strawberry Roads Take Me Home” has a sweet ring to it. 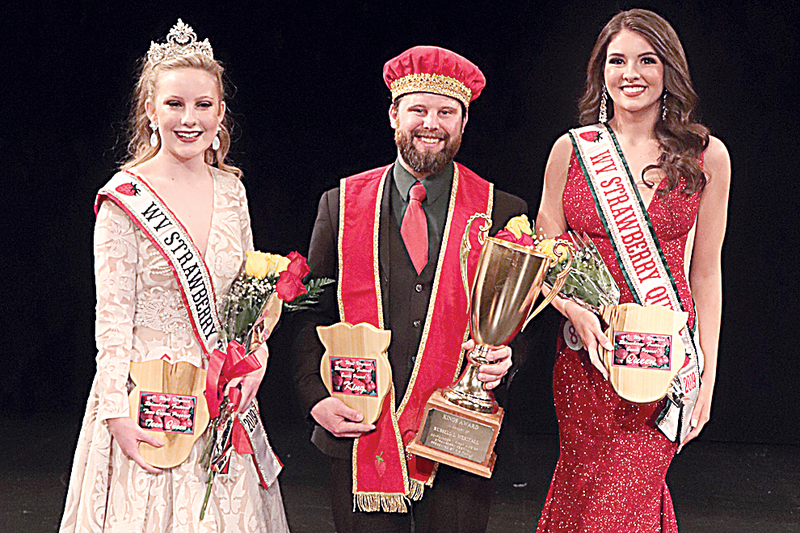 The queen-elect of the 78th West Virginia Strawberry Festival was selected from five contestants and will be crowned during the 7 p.m. coronation on Wednesday, May 15. Myers reaction captured in photos showed her surprise and joy at being named the WVSF Queen-elect. 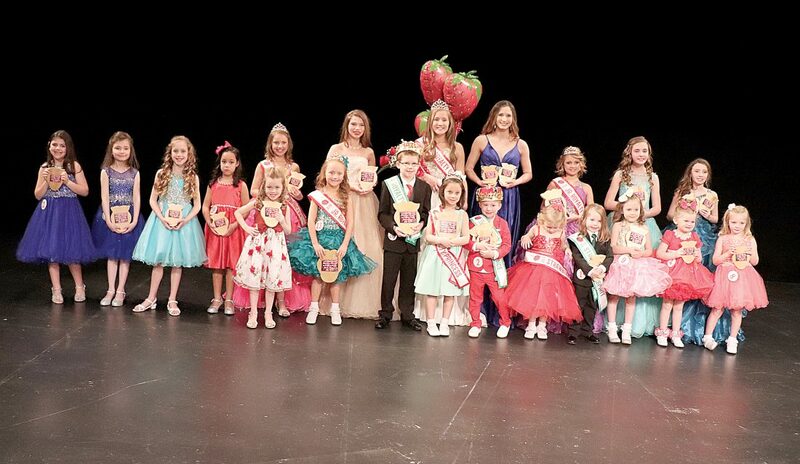 The Junior Royalty Review winners selected Saturday in the pageant held at the Virginia Thomas Law Performing Arts Center. Myers, a graduate of Webster County High School, said she has been to the West Virginia Strawberry Festival as a performer in the parades and enjoys stopping in Buckhannon for ice cream or a visit to her favorite restaurant, C.J. Maggie’s. Joining Myers in the queen’s court will be First Maid and photogenic winner Miranda Kalaskey, 22, of Charleston, and Charley Clayton, 22, of Morgantown. King-elect Joseph Robinson, of Mannington, is returning for the third year and wants to continue to promote farming in the Mountain State. Robinson said he already has 500 honeyed strawberries in the ground and another 500 in a high tunnel he constructed last year. 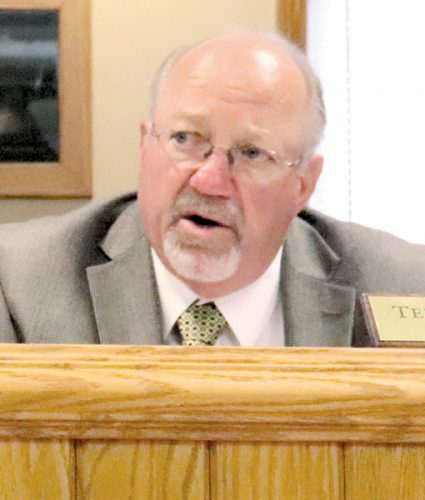 Through his membership in organizations like the West Virginia Christmas Tree Growers Association, Robinson said he spreads the word about the West Virginia Strawberry Festival and connects the dots with various agencies. Robinson will receive his crown for the third time at the May 15 coronation. 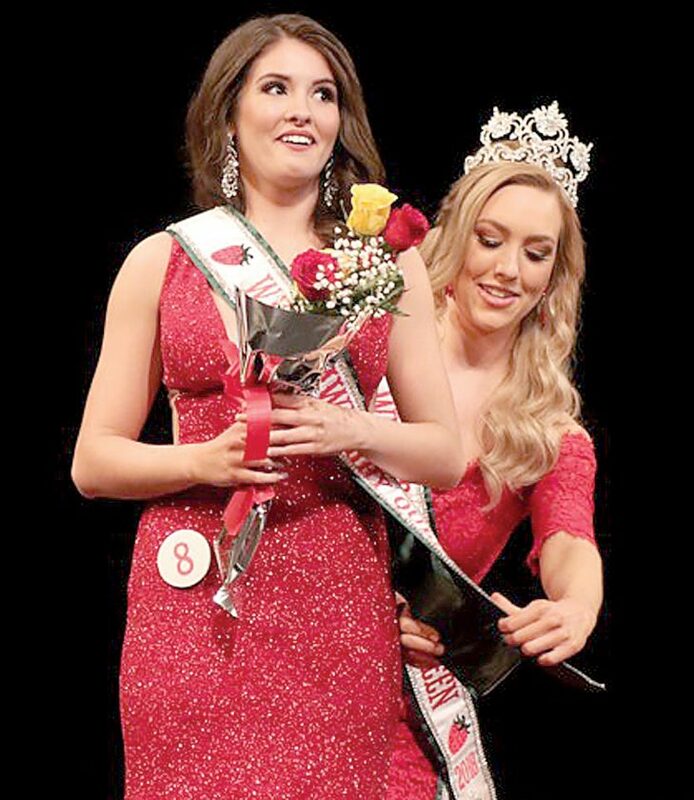 2018 Teen Queen Cayton Carder crowns 2019 Teen Queen Gracie Marsh. 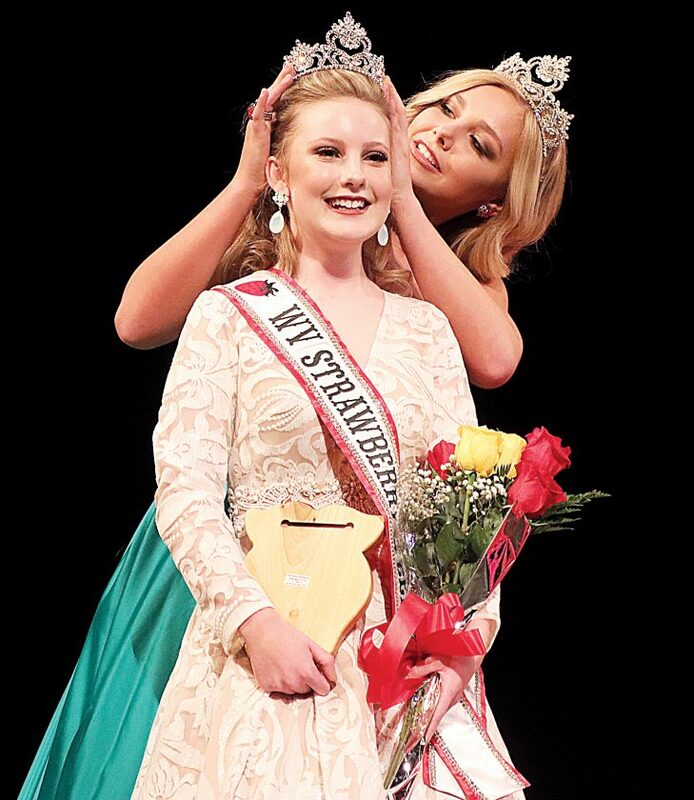 This year’s WVSF theme of “Strawberry Roads Take Me Home,” has special meaning for this year’s Teen Queen who is originally from Buckhannon. Marsh is a sophomore at Notre Dame High School. There were five teen queen contestants. Serving in the teen queen’s court will be First Maid and photogenic winner Ally Spellman, 15, of Bridgeport, and Second Maid Madison McCartney, 15, of Buckhannon. The festival’s new royalty pose for a picture with 2019 West Virginia Association of Fairs and Festivals Queen Alexis Bland. Left to right, are Teen Queen Gracie Marsh, Princess Madison Burnside, Junior Queen Molly Kuykendall, Princess Mia Beth Park, Bland, Princess Brystal Shaffer, Princess Gracia Knight and Queen-Elect Cassidy Myers. Hostess princesses Kelsey Riggleman and Haley Thomas received their sashes from Mayor David McCauley and commissioner Terry Cutright on Sunday. 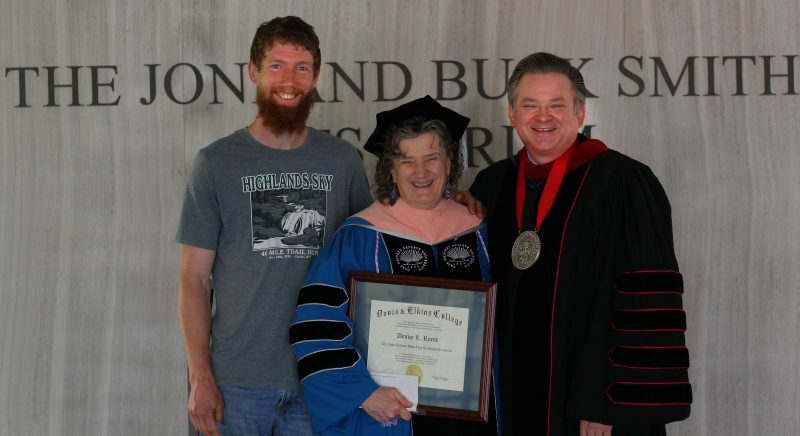 Riggleman, the daughter of Crystal Reed and Richie Riggleman, of Buckhannon, is a 2018 Buckhannon-Upshur High School graduate and is a freshman at Alderson Broaddus University studying exercise science. She is a member of the ABU cheer team. Thomas, the daughter of Kim and Danny Bryant, of Clarksburg, and Donnie and Lisa Thomas, of French Creek, is a 2018 graduate of Robert C. Byrd High School. On Saturday, the Junior Royalty Revue was held to select the festival’s young royalty from a field of 40 contestants. Molly Lane Kuykendall, of Petersburg, is a sixth-grader and participates in cheer and is a member of student council. “I love strawberries and I just thought it would be a fun title to represent,” she said. And when her name was called as the Junior Queen? First Maid Kendall Tucker and Second Maid/photogenic winner NinaMae Grace Coberly rounded out the junior queen division. Also winning in the 4-5 year-old girls division were Princess Mia Beth Park, First Maid Gracie Mae Rice, Second Maid Halle Faith Reeseman, Strawberry Spirit Ava Beth Hinkle and photogenic winner Annabella Tenney. For the 4-5-year-old boys division, Jace Tenney was named prince and photogenic winner while Liam Trent received first page and Strawberry Spirit accolades. 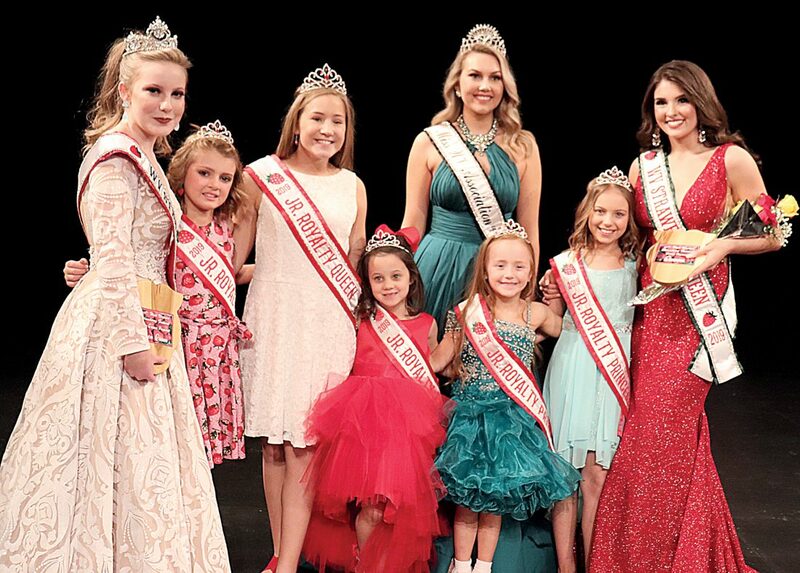 In the 6-7-year old girls division, winners were Princess Brystal Addyson Shaffer, First Maid Karly Hilliard, Second Maid Aaliyah Marie Lothes and photogenic winner Ella Whitehair. 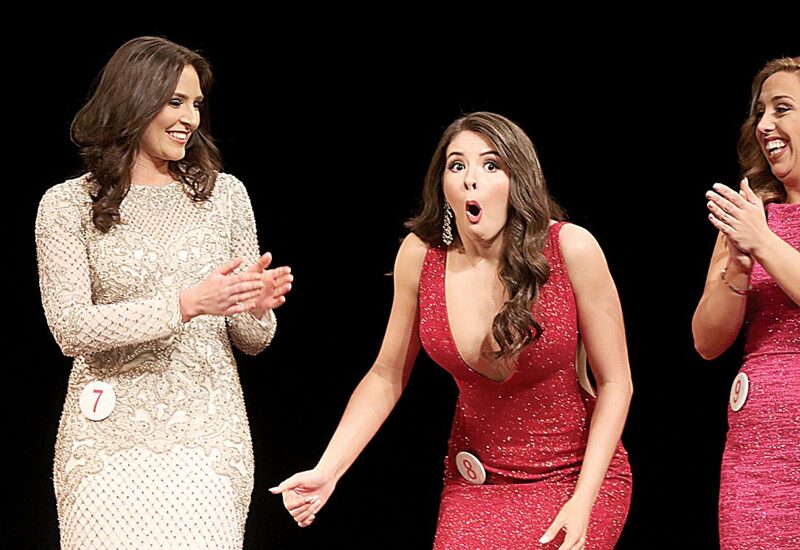 Queen-elect Cassidy Myers reacts after hearing her name called as the winner in Sunday’s Teen and Queen pageant. Gracia Knight was crowned princess and received photogenic honors in the 8-9-year-old girls division. She is joined by First Maid Liliana Star Delaney and Second Maid Claire Small. Kristopher Wyatt was named prince and photogenic winner in the 8-9-year-old boys division. 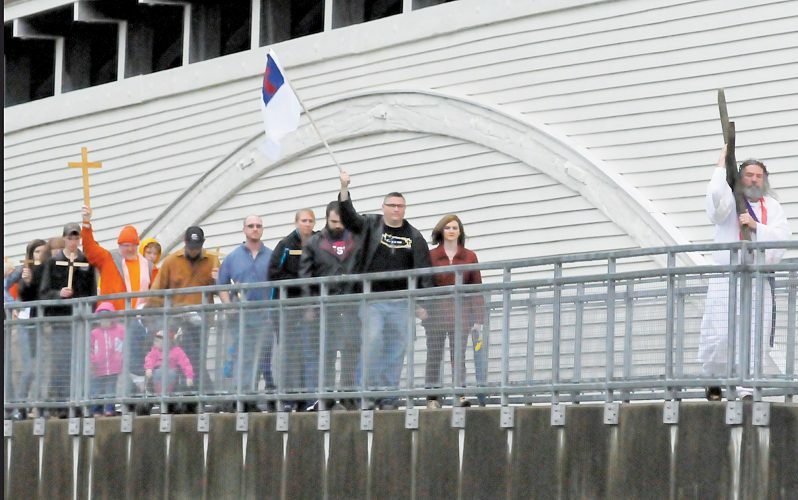 Visit www.wvstrawberryfestival.com for more information about the festival happening May 11-19. Teen Queen Gracie Marsh, King-elect Joseph Robinson and Queen-elect Cassidy Myers.